Yesterday I did something that I never thought I would ever be able to say! I ran my first ultramarathon! 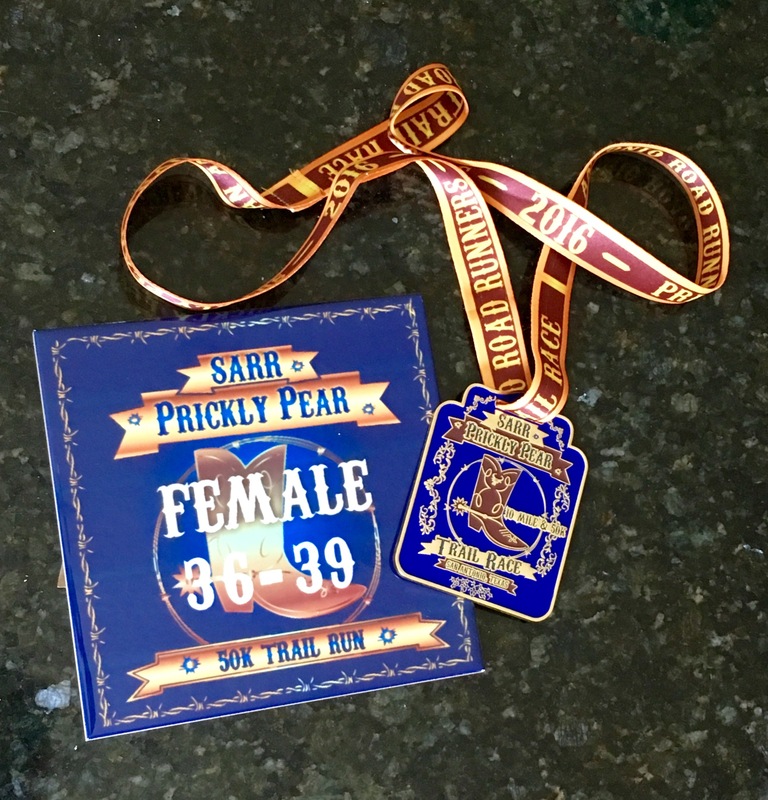 According to Wikipedia, an ultramarathon, “is any footrace longer than the traditional marathon length of 42.195 kilometres (26.219 mi).” In yesterday’s case, it was the Prickly Pear 50k, a 31 mile trail run. And having just run the New Orleans marathon three weeks ago, I figured adding another 4.8 miles would be no big deal! HA! And as I mentioned, besides the length, another unique aspect about this race was that it was a trail run. If you count the half marathon cave run as a trail run that I’ve done three times now, then this was my fourth trail run, but this race just seemed so much different as you’ll see below. First, let me start off by saying that I was extremely lucky to have my old swim teammate from Trinity, Christy join me for this adventure. Christy is pretty much a rockstar, as her list of athletic accomplishments include not only more than a dozen marathons (in the 3:35 range), but also a FULL Ironman. For those of you who don’t know, this means she swam 2.4 miles, then rode her bike 112 miles, and then ran 26.2 miles all in a row without stopping. Alas, she is a serious athlete. When I signed up for the 50k, I didn’t have anyone to do it with me, so I was super excited when a message from Christy popped up on my phone saying, “Do you want company on the 50k?” UH YES PLEASE!!! So long story short, we ran our first ultra together! The race was on a trail at the Land Heritage Institute on the south side of San Antonio. We got there before sunrise, having to find our way by headlamp. The small group of fellow crazies set out on the trail just a few minutes before sunrise. For those of you who don’t live in the San Antonio area and already know this, we had an extremely severe thunder and rainstorm the night before the race. And because this was a dirt and grass trail, this meant very serious mud issues plagued the trail. The race was two 15.5 mile loops and I’m not going to lie, that first loop was pretty much pure hell. The mud was so bad, and caked to our shoes, that they weighed at least 5 extra pounds, maybe more. My quads were telling me how tired they were by about mile 15. I cannot tell you how badly I wanted to quit and how long that first loop felt. Luckily, because the race took us ~6 hours, there was plenty of time for the sun to come up and begin to dry the mud as the race progressed. Thus, the second loop was luckily a zillion times better. It really was a pretty trail, through the Texas brush, lots of gorgeous wild flowers, and prickly pear cactus (hence the race name). There was also a short piece of the loop that went into the woods alongside a river (not sure which one?). It was neat to have a change of scenery midcourse. One main thing that I must note regarding this race: the fellowship amongst trail runners is incredible (as compared to road races). We met so many neat folks along the trail, shared stories, and just kept each other company while passing the time. And besides that, we never once passed by someone without being greeted with words of encouragement. It was really awesome to be continually met with praise and inspiration by every runner on the trail. I am not exaggerating. It was such an uplifting and positive environment. And like I said before, mentally I had struggled, especially in the beginning and hearing those words helped keep me in the game. Additionally, the support and aid tables along the course were frequent and awesome, stocked full of all kinds of goodies. We could not have done it without the volunteers manning those stations – very thankful for them. I promise that one of these days I will return the favor and work an aid station! I also have to note how I believe that Christy and I were led to this place together after not having spent a significant amount of time together in years. Besides loving running, Christy and I have something else in common. She too is a mother of three young children. And lately, I’ve really been struggling with the whole three kids ages three and under thing. And when I say “really been struggling,” that is a vast understatement – just ask Scott. There are things that Christy and I talked about during our six hours together out there in the gorgeous Texas wilderness that helped me gain perspective and get my head straight again. And for that, I thank her. Our conversation was so meaningful and honest and beautiful and cannot thank her enough. I felt like I was reborn out there on the trail. It took us 6 hours, 1 minute and 58 seconds to run our 31 miles and we tied for second place in our division which was super cool. We negative split it, running our second half several minutes faster than our first half, and our last mile was 9:20, so we definitely even had something left for the finish. And as we came running in, we spotted my good friend Melissa who did the NOLA marathon with me, who came to cheer us across the finish line. That was so awesome to see her and get one last energy boost from her cheers! My only regret is that we didn’t break 6 hours, but honestly, despite it being a trail (much slower than a road race), the thick mud, and all the stops required to refuel on a run this long, I was pleased to average faster than 12 minute miles. And to be fair, I swear that Christy probably could have shaved an hour off that on her own, but she stuck by my side every step of the way. We earned not only finisher medals, but neat tile/plaques as our prize for placing which made it extra special. At the end of the day, I can’t say I’ve drank the ultra Kool-Aid yet… only time will tell… I wouldn’t mind trying another trail run in the hill country on a more rocky and dry course. Maybe a just 25k though this time. I need to start winding this running season down as summer begins to approach! Previous Post 9 months: Swimming, Front Teeth & More! Congratulations for running your first ultra! That is amazing! I signed up for my first one this summer (50 miles), and am starting to get very excited for this new distance! Thanks for your recap, looking forward to hearing more! Wow!! That is awesome! I dream to one day do 50 miles! That’s incredible! Good luck!!! Just found your blog and want to say congrats on your ultra! My favourite line… the fellowship amongst trail runners is incredible (as compared to road races)….this is so true. I have ran trail races now for about 7 years and still do a few road races throughout the year but love the trail races. You are so right. The people are different. They are so welcoming and really want to see others do well.